LFCC: Would you like to know more…? I wish I could have been with you to see Joss, Alexis and Amy. Another great piece from Bunny. Bunny ‘s blog is your one stop shop for all things to do with events, conventions & more…. Update: LFCC Online Shop Closure Imminent! One of the highlights for me at Star Trek London in October 2012 was going to see Sir Patrick Stewart take part in a talk. It was an amazing experience, he graced us with stories about his life, career and of course Star Trek. That particular weekend Sir Patrick was not well and I said to myself I would love to see him again when he was feeling better (I should note even when ill he was simply brilliant). I was so happy that it would only take eight months before I would have that opportunity again. While scanning Twitter one Friday evening a couple of weeks ago I noticed a tweet from my good friend Bunny Summers. Bunny mentioned she would be seeing Sir Patrick in Oxford and that she was very excited. I think while I was still reading the tweet I had already composed my reply with “tell me more, where, when” etc. Soon enough I had the details and tickets were booked and off to Oxford I would go. The plan would be I would go up to Oxford early, meet up with Bunny and then see the talk followed by a couple of drinks before returning to London. As we know you can plan something but most times they will be completely different. Bunny had to cancel coming to the talk since she had an interview with Jamie Murray (please tell me you know who she is?). However, my very good friend Tanya was able to buy the ticket from Bunny. I did manage to spend a wonderful afternoon with Bunny and then met Tanya for tea before the talk. I will speak more about this later but after the hearing the talk I am so glad this was the case. Below is the link for the news article from the Oxford Mail by Katherine MacAlister. Both Tanya and I were very excited and when Sir Patrick entered onto the stage it was to roaring applause from the audience. Jonathan introduced the great man, explained that there would be about thirty minutes discussion between the two and then questions would be opened to the audience. Jonathan opened the talk by asking Sir Patrick how it all began. Sir Patrick told us about his English teacher Cecil Dormand who introduced him to Shakespeare when he was given a copy of “The Merchant of Venice”. Sir Patrick commented that even though he may not, at that time understood everything about Shakespeare he was not scared of it. To this day Sir Patrick keeps in touch with Cecil and only the other day Cecil was telling Sir Patrick that he works too much. Jonathan asked a really interesting question about directors and whether as an actor Sir Patrick changes his style to suit the director. Sir Patrick explained that sometimes you do this but he then told us about when he was in “Macbeth” directed in Rupert Goold’s production. There is a long scene when Macbeth hires two men to kill Banquo and his young son, Fleance, and Sir Patrick felt it was too long and that he needed to do something to fill in the scene. Rupert suggested that he make a sandwich? Sir Patrick agreed and felt this was a stroke of genius. Doing something as banal as making a sandwich while plotting the murder of a man and his son. I have to say I have seen this production and there is nothing more chilling than this scene. 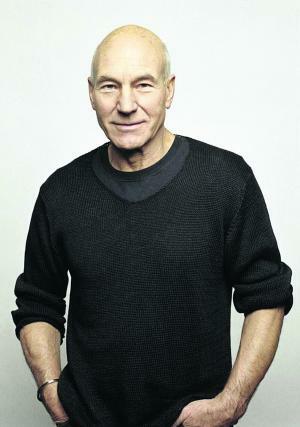 While speaking of sandwiches Jonathan entered the world of Star Trek, The X-Men and the other entire related roles Sir Patrick has played over the years. Jonathan spoke of Sir Patrick’s career as one of a sandwich where he began with Shakespeare, then moved on to Star Trek etc and then has returned to the stage. Sir Patrick liked this analogy of his career and spoke about the fact that he has recently returned from filming another X-Men film and will be off to America soon to perform his New York double Broadway stretch in Waiting For Godot and No Man’s Land with Sir Ian McKellen. Sorry fans in the UK, Sir Patrick will be away for some time now. Sir Patrick also compared the bridge of the Enterprise to that of a Shakespearean stage. It was a wonderful description, comparing the raised platform behind the command chairs and the captain’s chair as a throne. We then moved on to some of the questions from the audience. I have to start by saying that we had a great audience in the playhouse. The questions were thoughtful, articulate and they sparked discussion. The first question posed was if Sir Patrick’s voice was by nature or nurtured? Sir Patrick told us about his father, how being in the army he had trained his voice and you could see the visible pride Sir Patrick had for his father. His father had a good career as a non commissioned officer, which is something we all found out if you watched in the BBC’s “Who do you think you are”. Another question was about the roles that Sir Patrick would like to have played or hopes to play in the coming years. Sir Patrick explained that he would have loved to have played Hamlet, Romero, and Snug but alas he feels that now he is too old. Although Sir Patrick has not entirely given up on playing these characters since he told us about a company of actors in New York who simply turn up and record the plays on audio. He would love to have a go at this and this might allow him to play those roles he craves. In another answer Sir Patrick spoke of his time in his one man production of “A Christmas Carol, “ how playing forty parts allowed him to become a better actor that it removed any fear he may have had while on stage. To my regret I have not seen this and I do hope that Sir Patrick will perform this one last time (as mentioned at Star Trek London). While answering one question Sir Patrick was complimented on his cowboy boots. He explained how he went horseback riding and was wearing his “sneakers” but was told he could not wear those! So he bought a pair of boots and he has not looked back. Sir Patrick now owns three pairs and loves wearing them. To a roar of laughter he explained that they also help you to feel more of a man and at his age anything that can help this will be appreciated. While talking about roles etc Sir Patrick mentioned that he had always wanted to play Othello. He told us about the idea he had of making Othello white and reversing the rest of the cast to be black apart from the servants who would also be white. He tired for many years in the UK to make this happen but through some luck he was able to “make it so” (sorry) in Washington. He told us about how hard it was to convince fellow actors this was the right thing to do, that this would work. Even when the production opened Sir Patrick did encounter some hostility to his performance but overtime this grew less. It was an amazing experience for Sir Patrick. The one question about Star Trek was about whether his classical training helped the role of Picard or even in the X-Men. Sir Patrick then spoke about Sir Ian McKellen and Hugh Jackman who were both classically trained and bring so much to the roles that are away from the stage. One question that surprised Sir Patrick was when a man asked what career path he should take and the options did not include acting. Sir Patrick quite rightly said that these type of decisions need to be taken from the heart. Once you know what your heart wants the rest should come together. Also when asked how does one make children love Shakespeare by a school teacher Sir Patrick said that you cannot make someone love something, all you can do is guide them towards it, nurture them like he was all those years ago by Cecil. One interesting question was about Sir Patrick’s use of Twitter. Sir Patrick explained that he uses it mainly for fun but social media does have a power can be used for good. He mentioned when he took the picture of him standing over a supermarket in France called “Picard”. It was retweeted over ten thousand times. “That is real power” said Sir Patrick. Every question started with the person telling Sir Patrick how wonderful he was, how he is one of the greatest actors of our generation. As always Sir Patrick took all this in his stride but the audience was so right. I love Star Trek (as you might know) but during this talk I didn’t want to know anything about it. When we moved on to Star Trek I just wanted to skip this to get back to the stage, about his life. Just anything but Star Trek. It was a thrilling talk: about one man’s passion for his work and his art. Every minute I was captivated by every word that was spoken. I hope that one day I get to see Sir Patrick again but if I don’t this will be the talk I remember, about the man, about his career. Thank you Sir Patrick for an amazing experience. Find out more about supporting the Oxford Playhouse. Thanks to Bunny & Sina for their help with this piece. Continuing on from my previous feature I wanted to look at another starship captain who became obsessed to the point of possibly losing his command, the respect of his crew and crossing that fine line starship captains have to tread between defending the Federation and their own personal agendas. That Captain is Benjamin Sisko and his obsession was Commander Michael Eddington……. Michael Eddington joined DS9 as the head of Starfleet security of the station after the threat from the Dominion became evident and after Starfleet lost trust in Odo. Eddington seemed liked the perfect Starfleet officer, dedicated to his duty, believed in the chain of command. This sense of duty even led him to deliberately sabotage the Defiant when Sisko wanted to prevent the joint Cardassian / Romulan fleet attacking the Founders home world. An act that some of his fellow officers did not take well but Sisko gave him the benefit of the doubt, he developed a relationship with Eddington and over the next couple of years a good working relationship was created. Then it all changed. The Federation was going to supply the Cardassians industrial replicators to help them recover from the brief war with the Klingons. The terrorist group known as the Maquis had been allowed to increase their actions within the demilitarised zone due to the tensions with the Klingons and it now looked as if the replicators were their next target. Eddington and Worf discover and inform Sisko that his girlfriend Kasidy Yates may be smuggling for the Maquis. There was a threat from the Maquis but it did not come from Yates, it came from Eddington! Using Kasidy as bait (she was in fact supplying goods to the Maquis) to draw Sisko away from the station Eddington is able to take possession of the replicators for the Maquis and their cause. In a tense conversation between the two, Eddington explains to Sisko why he defected to the Maquis. He does not respect the way the Federation have treated those in the demilitarised zone, he warns Sisko that any further intervention from Starfleet can only have consequences. Sisko replies that he will not stop until he has captured Eddington and arrested. So begins his obsession with capturing Eddington. In the episode “For the Uniform” we find that Sisko has been trying to capture Eddington after the events of the stolen replicators for over eight months. Within in that time he has come close a couple of times to capturing him but he always manages to get away. Sisko thinks he is meeting an informant but instead is ambushed by Eddington. Again he has been outsmarted by his former chief of security. Eddington again tries to tell Sisko not to take this personally but that has no effect. While being chased by the Defiant Eddington triggers a cascade virus; one that he planted on the Defiant causing the ship to have a systems failure of the main computer. This prevents Sisko capturing Eddington and causes Starfleet to take Sisko off the hunt for the traitor. The crew discover that the Maquis have been developing biogenic weapons. They release them on a Cardassian colony which makes the planet uninhabitable. Sisko going against orders takes out the badly damaged Defiant to try and stop them using the weapons again. Two more times Eddington manages to outsmart Sisko and avoid capture but Eddington makes a mistake. He allows Sisko to learn more about his character when he leaves him a copy of Les Miserables. Using his own sense of importance to defeat him Sisko threatens to destroy a Maquis colony using biogenic weapons and if Eddington does not surrender he will continue to use the weapons on each and every Maquis colony. Eddington calls Sisko’s bluff and to the shock of his crew orders the weapons to be fired making the colony inhabitable. Eddington does exactly what Sisko expects and surrenders as the hero he thinks he is. Sisko is finally able to arrest the man that has haunted him these past eight months. While discussing Eddington with Dax we discover that Sisko did not consult Starfleet with his plan concerning the biogenic weapons on the Maquis colonies. Not only did Eddington beat Sisko he went on to outsmart him quite a few times. He was able to anticipate what Sisko would do and in some ways made Sisko look amateurish. Instead of looking at how his obsession with Eddington was clouding his judgement Sisko walked into one disaster after another. The Defiant had been crippled; the ship was only functioning with some major jury rigging by Chief O’Brien but instead of allowing Starfleet to handle Eddington Sisko risks his ship and crew to go after Eddington. Was this a rational decision? Not in the least, is it heroic? Most probably. Would you expect this from a Starfleet captain? In the end it is Eddington who plots his own downfall by revealing too much of himself to Sisko but Sisko went against everything he believed in by launching the biogenic weapons. Had the thought of Eddington escaping again push Sisko over the edge? I think it did. Sisko could have and perhaps should have been relieved of command by Kira or Worf. Of course loyalty to Sisko meant this would not happen but you could tell there were many frightened and confused faces on the bridge of the Defiant during those tense minutes. Had Sisko lost his mind? What should we do? How far do we let him go with this? All these questions must have been going through the minds of his senior command team on the Defiant. Did Sisko truly understand what capturing Eddington would cost him? I don’t think so. While the end may justify the means I think Sisko crossed a line here, one that meant he would be willing to do so again if it meant he could achieve his objectives. During the dark times of the Dominion War we would see Sisko throw away all that he believes in to ensure the Romulans would enter the war (“In the Pale Moonlight”). Sisko’s obsession with Eddington consumed him for over eight months but the after effects of that obsession would continue to remain with Sisko for the rest of his life…. I am back in London for a couple of weeks and I have to say its always good to back in the best city in the world (in my opinion of course). I am catching up with friends and family which is nice and have a couple of other things planned. I am staying at my mums and I am not sure if I am the only one but whenever I go home everything seems so much smaller than it did the last time I was here. I have been going out for a few walks around where my mum lives and seeing all the places where I use to play, hang out with friends and as the title of the posting says nothing changes really. I am feeling quite nostalgic lately so I seem to be reflecting more then ever on my youth, decisions made, paths chosen etc. I have been spending a lot of time with my nephew and his girlfriend at the moment. It seems odd every time I say nephew since Jon is 32 years old and I was 8 when he was born. It’s almost like we grew up together (I suppose we did). Jon & Theresa are so much fun, we stayed up til 3 am watching movies at the weekend. We also saw the “Hobbit” again which I really don’t need an excuse to watch it. We are watching all three “Lord of the Rings” films this weekend in one day and I am looking forward to that. A day in middle earth will be great fun. We are also going to see “Man of Steel” on Friday. I am going to write a review of the film but I have to say as I write this I am excited to see it but I am not as hyped up as I was for Into Darkness. I recently commented on Twitter that I was not impressed with another origin film but as Matt Rushing quite rightly said like Batman Begins this is for a new generation. I have read a spoiler free review that says that the film descends into pure action and no character development from the third act but lets hope its not true. I do love the fact that both the actors who are playing Superman and Spiderman (Real American icons) in the new “reboots” are British. In terms of podcasting this Saturday see some changes to the Holodeck. I am not giving anything away but again I refer you to the tile of the posting. Sina and I had an amazing time recording the show on Sunday (listen to the bloopers). We missed Bunny who is still in the process of having her internet installed but soon the gang will all be back together soon. I will talk more about the changes very soon. I look forward to your thoughts. Last weekend was the first birthday of Ten Forward. We recorded our monthly book club with Melissa from the Delta Quadrant looking at the Cold Equation Trilogy by David Mack. This week we are reading out our birthday messages and playing voice messages etc. I love being on Ten Forward, its an amazing show. We have some wonderful formats, meet some wonderful people etc. For me Ten Forward is where I met Sina and from that first recording we have become great friends. Makes it all worth it! Now as you know I don’t like to rant (Sina, say nothing!) but I just want to say there are more important things to life than websites, podcasting . I love both but sometimes in life things happen that mean you have to put all this to one side and get the things that matter the most done first. An example of this is when you move house and change your job. So all I am going to say is why not give people some slack, back off, stop your moaning and instead give the person some time and respect! That’s a general rant, read what you want into it. Not long now till the London Film and Comic Con. As we know its becoming more and more the official DS9 reunion event. I am so excited but will have to manage the budget to get the most out of the day. However, next Friday is going to be amazing. I am off to Oxford for the day to see Sir Patrick Stewart give a talk. Thanks to Bunny for telling me about it. More to come next week after the event. Then at the end of the month is Trekology with Laura, Bunny and Matt. Looking forward to this, will be great fun! I will write some more at the weekend after seeing “Man of Steel” and as always you can find me on Ten Forward and the Holodeck. Have a great weekend one and all…. Thanks to Sina, Bunny and, Laura. You know why….